Gustavo’s favorite question is “what if?” That simple question has helped him on his quest for continuous exploration and experimentation. Change has always been a constant to Gustavo. His diverse background is at the intersection of Change Leadership, Marketing Strategy, Innovation and Design Thinking. He has led and transformed six organizations in different scenarios: start-up, high-growth and turnaround; and has worked in diverse places: New York, Argentina, Chicago, Puerto Rico and Los Angeles. 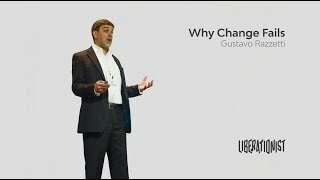 Gustavo has over 20 years of experience in helping organizations thrive in change in the U.S., Latin America and Europe. He loves advising CEOs from both Fortune 500 and startups alike. 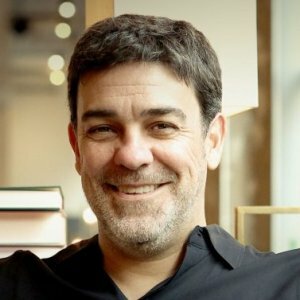 The author of hundreds of articles on change leadership, innovation and self-improvement, Gustavo has just finished writing the –soon to be published- book “Stretch for Change”. Based on his dedication and hunger to continually experiment, he participated in the cutting-edge -by invitation only- Innovation Leadership program at Stanford University. The program focuses on developing coaching and leadership skills needed to drive good innovation process in groups. Participants work on real projects driving design thinking projects within organizations, as they experiment with their leadership style while coaching innovation projects. 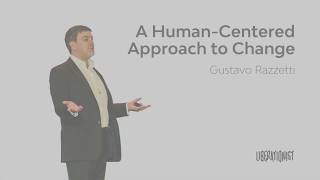 Gustavo nailed it perfectly and unlocked “the change agent” gene within each of our employees! Our teams had a blast and were very moved and energized. Gustavo inspired our teams to stretch their minds and start our own “change” revolution! Gustavo and his team brought a new perspective, through exercises that allowed everyone to feel safe and free to explore. Liberationist session was a gamechanger. It created alignment among the leadership team, they got us to think differently through exercises that made us feel uncomfortable and helped us established a concrete, innovative, and forward-thinking platform to scale our events offering. We are still talking about the positive impact that Liberationist created in our team. 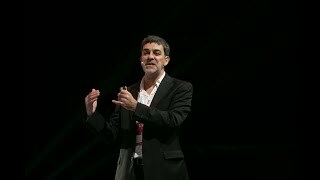 Gustavo’s message and insights about the power of adaptability in education were very important and meaningful to our audience. His keynote was a great contribution to the success of our conference. Gustavo's words and mindset have already caused educators to start leading changes in their organizations. 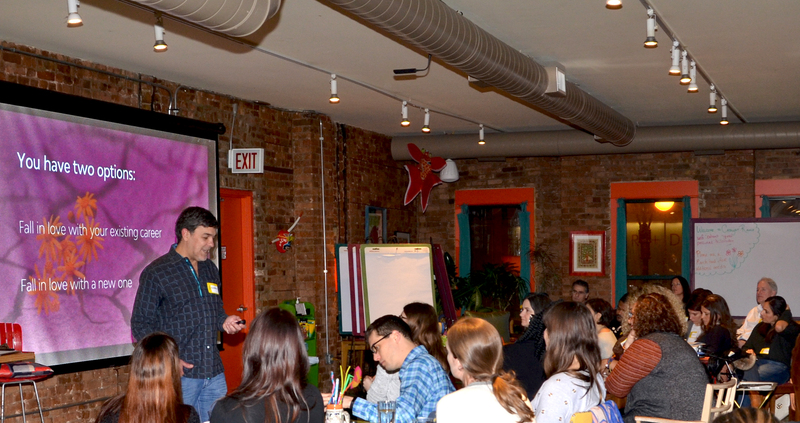 Liberationist led several engaging, eye-opening sold out Labs for Chicago Ideas. Through a series of exercises that uniquely illustrated the many different ways individuals look at something, attendees were led to think about how to use the different styles to build better teams, approach clients and solve problems differently. Gustavo makes me think in a way that, when I leave his presence, I take those learnings, strategies, and thoughts, and utilize them throughout my life. Gustavo and his team were AWESOME!! We have gotten such great feedback from our staff and thoroughly enjoyed all of the group activities. They turned our company retreat into a cultural transformational experience. 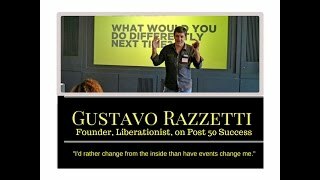 Stretch for Change, a new book by author Gustavo Razzetti, addresses a paradox: people want to change but have a hard time changing. Looking for new solutions? Start by challenging your own perspective. Borrowing a fresh pair of eyes can open up new possibilities and spark innovation. That was the theme behind our Our Chicago Ideas Week workshop. A highly interactive session challenged participants own perspectives, and pushed them to look at things in a fresh way—all in order to solve business challenges they were facing. It’s no secret that workplaces and workspaces are changing. Adaptive, collaborative, inspirational, and fun are some of the solutions that creative organizations are exploring to foster more innovation and productivity. Understanding space, both physical and emotional, has become critical to design a culture of creativity. How does this affect collaboration for those of us in the “Idea” business? How might we hack space to better work together? How might a culture of vulnerability and collaboration promote creativity? Chicago's creative agency community joined us for an interactive panel discussion with industry leaders as they shared their perspectives about the intersection of space, culture, and creativity. Change is taking a toll every organization. 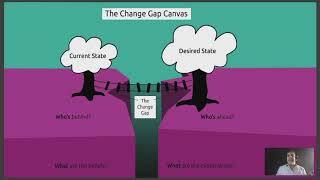 Regardless of our roles, we all suffer from the gap created by antagonistic expectations. The tensions between current and desired state, between where leaders and teams expectations add stress and slow change down. This framework and tools will help assess the Change Gap and develop a strategic approach to accelerating transformation. Liberationist has become a member of Konsälidön, a global network of independent boutique management consulting firms. Konsälidön is the tipping point ushering in the new era in consulting. It's first-of-its-kind digital platform connects organizations with consulting teams more efficiently than in the traditional consulting partnership model. The platform enables an agile, decentralized and distributed global consulting offering. When was the last time your team called a timeout? Playing is important, but it's not everything. Your team needs time to practice and reflect. Pause. Regroup with your team to make necessary adjustments. What's working and what can be improved? This workshop will improve your team's game by uncovering potential blind spots and crisis as well as experimenting with new tactics. Has your team lost its mojo? 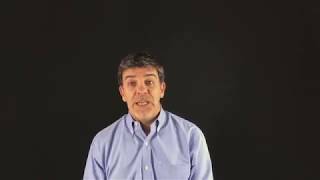 Does your team feel stuck? Before you team becomes dysfunctional, play the reset button. Even the most successful teams get stuck from time to time. This workshop will help you unblock your team and improve its performance. Join us and reboot your team. Innovators have to survive attacks from both friendly and unfriendly fire. Disguised as a "Friend" or exposed as a "Thief", they will try to stop you. Understand, fight and neutralize the Enemies of Innovation. Book this in-company workshop. Innovation is a dangerous mission. Building the right team is critical. It can make or break your innovation operation. Learn how to design the perfect team to drive change in your organizations. A team of misfits encourages diversity of thinking by having clear roles, accountabilities and team purpose. Organizations invest a lot of money and time in innovation. Yet, when it comes to driving adoption, or scaling cultural change, most companies struggle. Over 70% of innovation failures are due to employee resistance and unsupportive management. This 30-day sprint will help you change that. Prepare your culture. Accelerate Innovation. Culture is the glue that brings a team or organization together. But if the glue is too sticky, it can make them stuck instead of making them stay together. Our workshop will inspire you to stretch your organizational culture. The ability to deal with uncertainty can make or break a team. We don’t see reality; we see our version of reality. Does your company have a 'mistakes policy'? Are errors tolerated, punished, encouraged or rewarded? Celebrating mistakes has become, not only accepted but cool. The problem is that we are rapidly shifting from a culture of fear to one of zero accountability. Your team should make more mistakes, but celebrate what they’ve learned not just the error. Read about corporate mindsets regarding mistakes, the different types of learnings your team can get, and how to build a culture that encourages learning with accountability.